The. Easiest. Biscuits. Ever. 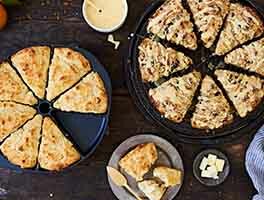 Simply mix equal parts (by weight) self-rising flour and heavy cream; scoop biscuits onto a baking sheet, and bake until golden and tender-yet-slightly-crisp. Oh, oh, OH so good! 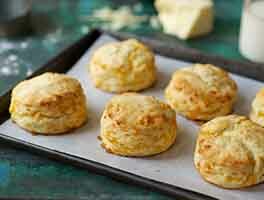 Ultra-tender, super-rich, they're the fastest/easiest biscuits you'll ever bake. 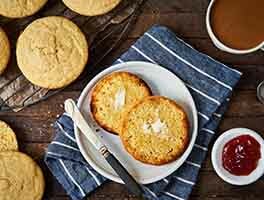 And there are lots of ways to take them from simple to sublime — find our favorite variations, from sweet shortcakes to herb biscuits, in "tips," below. *If the dough doesn't come together readily, dribble in an additional 1 to 2 tablespoons cream, to make it totally cohesive. Preheat the oven to 450°F, with a rack in the top third. Mix the flour and cream until smooth and cohesive. Scoop 1-ounce balls of dough onto an ungreased or parchment-lined baking sheet; a tablespoon cookie scoop works well here. Leave a couple of inches between them. Not into scooping? Pat the dough 3/4" thick and cut biscuits with a cutter instead, if desired. Brush the tops of the biscuits with cream, milk, or water; this will help them rise. Bake the biscuits for 10 minutes, or until they're light golden brown on top. Break one open — it should be baked all the way through. Remove the biscuits from the oven, and serve warm, or at room temperature. Store, well-wrapped, at room temperature for several days; freeze for longer storage. These biscuits are a blank palette, just waiting for you to stir your favorite additions into the dough. To make Self-Rising Cream Shortcakes: Add 2 tablespoons sugar and 1 tablespoon vanilla. 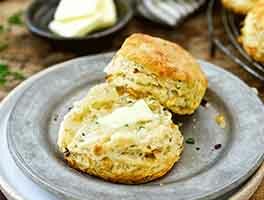 To make Never-Fail Biscuits with Herbs: Add 3 tablespoons fresh herbs. 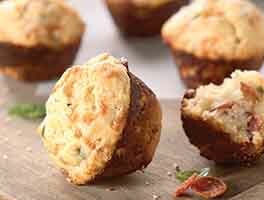 To make Easy Bacon-Cheddar-Chive Biscuits: Add 1/2 cup chopped cooked bacon, 3/4 cup chopped sharp cheese, and 3 teaspoons snipped chives. To make Easy Pumpkin Pie Spice Biscuits: Add 2 tablespoons sugar and 1 1/2 teaspoons pumpkin pie spice. 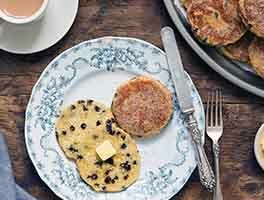 To make Easy Sausage and Apple Breakfast Biscuits: Add 3/4 cup each cooked, crumbled sausage and peeled, cored, diced apple; plus 1 teaspoon cinnamon. For larger biscuits, simply scoop the dough into 1 1/2-ounce balls, to make 8 biscuits; or 2-ounce balls, to make 6. Bake the larger biscuits a minute or so longer, or until they're baked all the way through. This recipe is ridiculously easy to scale up (or down). Simply use equal amounts of flour and heavy cream, by weight; each biscuit uses about 1 ounce of dough. So if you use, say, 4 ounces of flour and 4 ounces of cream, you'll make 8 biscuits. Or 12 ounces (3 cups) of flour, 12 ounces (1 1/2 cups) of cream — 24 biscuits. Feel free to stir the additions of your choice into the dough. Berries, cheese cubes, crumbled bacon or diced ham, chopped scallions, chocolate chips, dried fruit... use your imagination! To make now, serve later, place shaped/unbaked biscuits close together on a small baking sheet; place the sheet in the freezer, and freeze until solid. Transfer the biscuits to an airtight container (plastic bag, etc.) When you're ready to serve, there's no need to thaw the biscuits; remove them from the freezer and bake as directed above, adding a few minutes to the baking time. Okay so I grew up only knowing "Bisquick" biscuits ... we are obviously not from the South! Where have these been my whole life?!? I've never made a biscuit (never liked the ones Mom made sorry Mom!) so these were my first attempt. Woooo! May have been a mistake for my waistline that I ever tried! Made an amazing addition to dinner tonight!! Hubs and I were both loved them!! Thanks for the recipe, KAF!!! These are the best biscuits I've made! I followed the directions and suggestions, stumbling along the way and while distracted on the telephone. I even had a bit too much flour after mixing. I just scooped the extra flour out and gently formed light balls by hand. They came out amazing. Ummmm - flat - needs more salt and I added more than called for, baking much longer than called for my first time with this method. I wouldn't call them hockey pucks, but maybe close. Love this recipe. I haven't tried it with just heavy cream yet... but, I always make a double batch with 12oz flour, 1/2tsp salt, 6oz half n half, & 6oz whole milk. Super easy, especially since I then dump it in a 9x9 pan (I score 6-9 biscuits into it), & it bakes up perfectly. Had to make a double batch this time! Oh Wow! I bake for fun, and I'm pretty good for an amateur, but I've always struggled with biscuits. But, this recipe! Oh My! It exceeded my expectations! Six stars!